And the people refused to accept Jesus. But Jesus said to the people, "Other people give honor to a prophet. 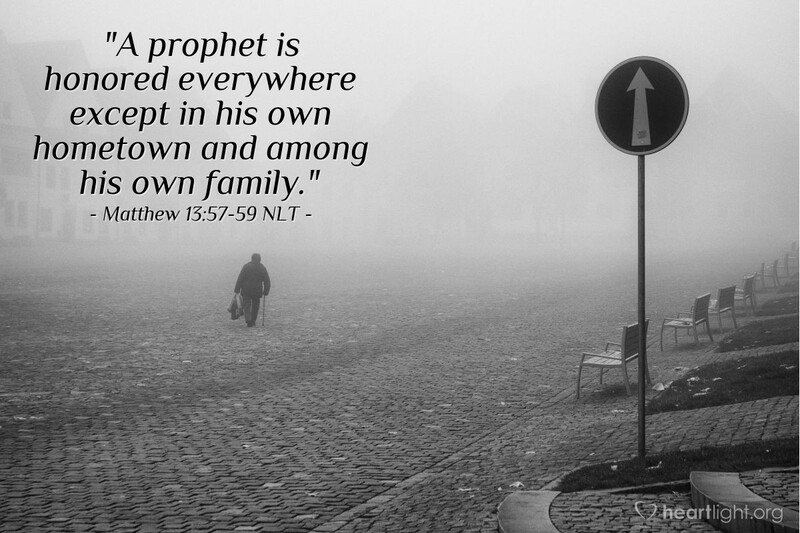 But people in that prophet's own town or own home don't give honor to him." The people there did not believe in Jesus. So Jesus did not do many miracles there. Jesus is all powerful, but we can limit his power by our lack of expectation, by our wimpy faith! His work is hidden, sometimes even denied, to those who refuse to believe in Jesus' power. So let's be a people who not only pray, but pray with faith and expectation, anticipating Jesus' mighty work and providential surprises. Holy Father, forgive me for the times I have limited Jesus' power by not believing in his power to act, minister, and save. Give me a heart of faith with the courage to expect Jesus to do great things in my life to bless others and bring you glory. In Jesus' name I pray. Amen.